I began my career when filmmakers largely didn’t worry about buying camera equipment. At the time, all theatrical features and most episodic television was shot on film. Panavision and Arriflex supplied most of the cameras and Panavision didn’t and still doesn’t sell equipment - you could only rent. You could buy a complete 35mm Arri package, for somewhere in the six figures, so they were mainly purchased by rental houses. Even the less popular brands, Moviecam or Aaton for example, were no less costly. For all intents and purposes cameras were rented, period. The same went for accessories: lenses, tripods, fluid and gear heads, matte boxes, follow focus units, all came as part of the rental package. The equipment was invariably high quality, expensive, and supplied by just a handful of manufacturers. And as long as everything was well maintained, you could count on it all working together perfectly, every time. To say things have changed a bit would be a gross understatement. Digital cinema has given filmmakers of almost any financial means the ability to create high quality images. 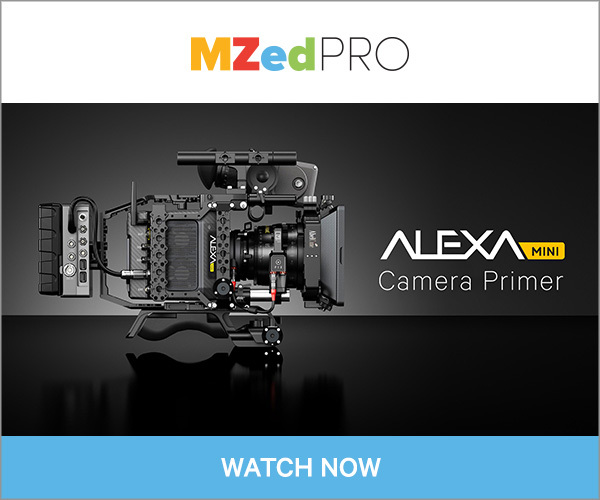 A dizzying array of paradigm busting, line blurring cameras, support equipment, software, and accessories have entered the market, with as many new manufacturers. So when it came time to outfit my own digital cinema camera, the choices were numerous and a bit overwhelming. As I pored over the available gear I had one overriding intention, to obtain the traditional, high quality feel and workhorse durability of the equipment to which I had become accustomed, and not go broke in the process. 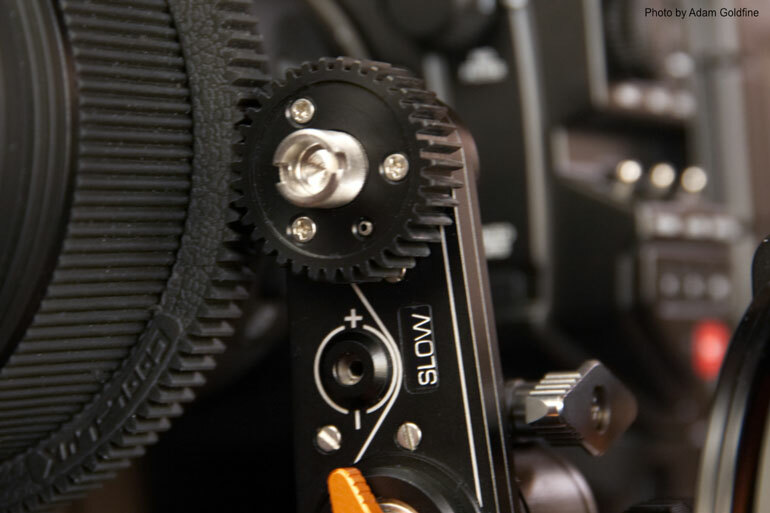 A poor quality or sloppy follow focus unit can make getting crisp focus pulls and rack focus shots nearly impossible. Having a well built, double-sided, modular, and most importantly, smooth and backlash free follow focus was high on my list of priorities. Arri and Chrosziel were familiar and obvious choices. Newer to the follow focus game, OConnor’s gear seemed very promising, but a bit over my budget. I was tempted by several of the less expensive manufacturers whose systems could do everything I needed, but my lack of familiarity and the mixed reviews left me concerned that I might come to regret that choice. 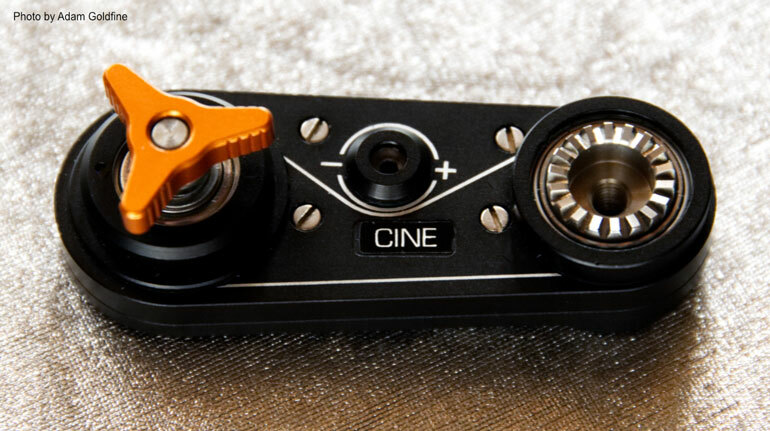 By chance I came across Bright Tangerine and their Revolvr Follow Focus. It comes in several kit configurations, which can include single or dual hand-wheels, 15mm LWS, 15mm or 19mm studio bridges, and an array of accessories. I chose the single sided 15mm LWS kit, which includes a single hand-wheel and mounts to 15mm LWS rods, as the name implies. A second hand-wheel can be added later for dual sided operation, as can the 15mm and 19mm studio bridges. 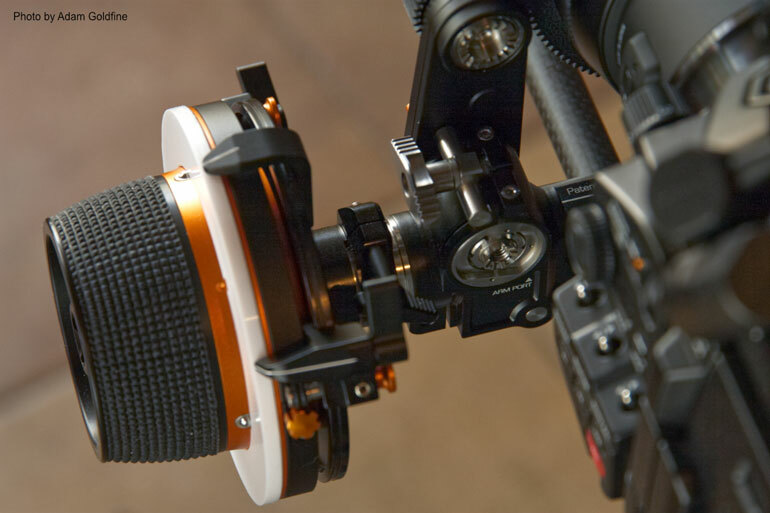 A single sided only follow focus is also available, the Revolvr Atom, based on the same zero backlash design. for those not needing a dual sided follow focus. The heart of the kit is the 15mm LWS core bridge. It can be mounted and dismounted quickly without disturbing the rest of the set up, and is latched firmly to the support rods with the flip of a quick-release lever. A safety button prevents the lever from accidentally opening and ruining your day. 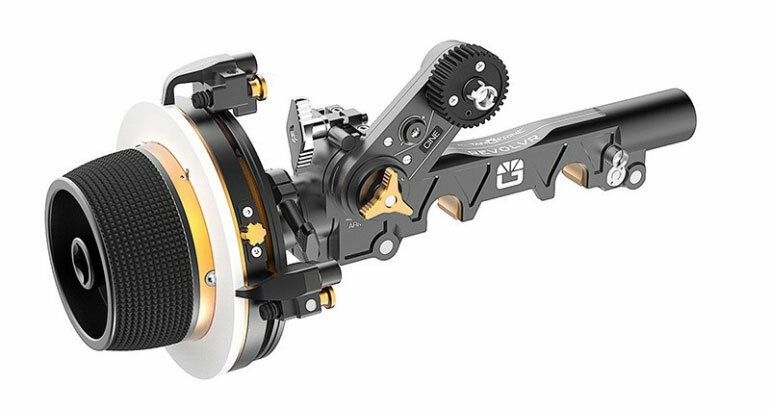 A detachable swing arm can be mounted on either side of the core bridge (closer to or farther from the camera) and is available in two speeds: 1:1.842 for cine lenses and 1:1 for use with still lenses with their much shorter focus rotation. As configured the kit includes the 1:1.842 swing arm. Once attached to the core bridge, the arm is swung into position until the drive gear meshes with the lens’ focus gear. It is then locked down and held firmly in place. The kit includes two drive gears. Both are the industry standard 0.8 Mod - one has 35 teeth, the other 43 - allowing you to further fine tune the ratio between hand-wheel rotation and focus ring rotation. The smaller gear is also thicker - 10mm vs 6mm - so it will remain meshed with lens focus gears that travel in and out as they are rotated. 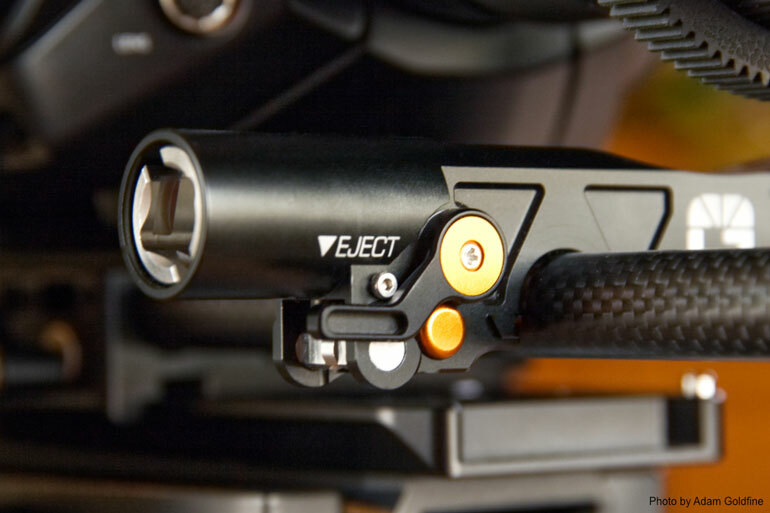 The swing arm will also accept Arri Follow Focus gears. The hand-wheel, which measures a bit over four inches in diameter, can be mounted on either the left or right side of the core bridge. The gripping surface is textured with high quality rubber and feels almost luxurious to the touch. Industry standard, detachable marking discs can be pre-indexed to specific lenses and snapped on and off with lens changes. Available accessories including a hand-wheel extension, speed crank, flexible whip, a reversing gear, and a flashlight holster. A small hand-wheel is also available, measuring roughly 3.5 inches in diameter. Bright Tangerine solves this problem quite smartly with their Hard Stop Pack included as part of this kit. The hard stops can be attached to either size hand-wheel, positioned independently anywhere along its circumference, then locked in place. One hard stop is scribed with a white index line on its pointer. Stainless steel plungers with rubber covered ends can be activated causing the hand-wheel’s index pin to come to a soft stop as it hits the plunger. If you are using a still photo lens you can easily set one hard stop at the close focus limit and the other at infinity, preventing any loss of index. You can also use the hard stops as focus marks in particularly critical situations, ensuring consistent, repeatable results, take after take. Retracting the plunger disengages the stops without having to remove them from the hand-wheel. It’s a simple but incredibly effective system. None of that versatility would mean anything if the unit didn’t perform its core function well, which is to smoothly, precisely, and repeatably adjust focus. I’m happy to say this unit is more than up to the task. 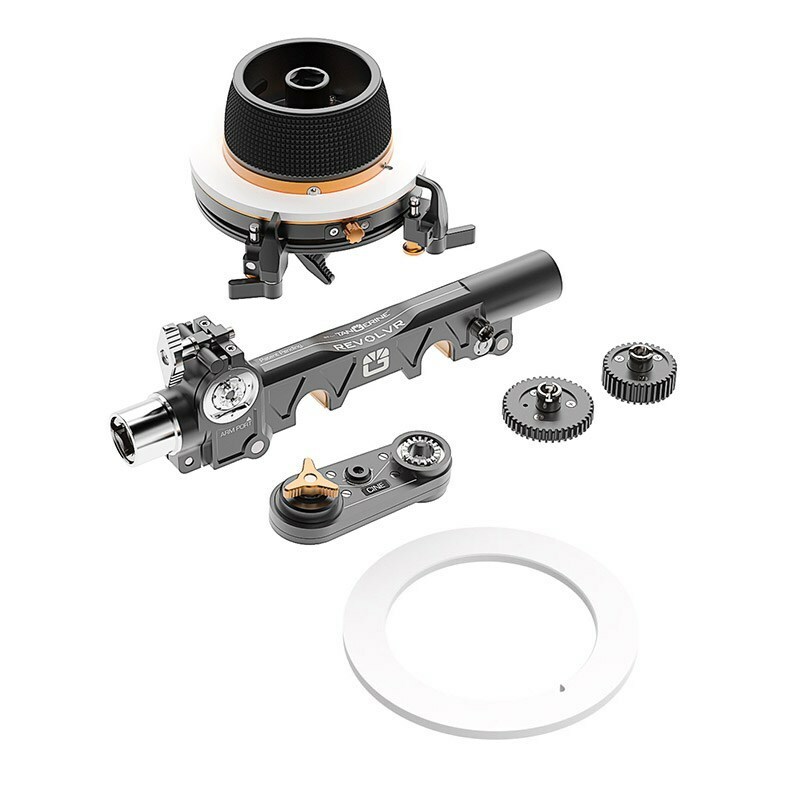 It is very smooth operating, nearly frictionless when spun freely, and provides an immediate and intimate connection to the focus ring of any lens you have mounted. There is absolutely zero lash, zero play; the slightest turn of the hand-wheel translates into precise focus adjustments at the lens. 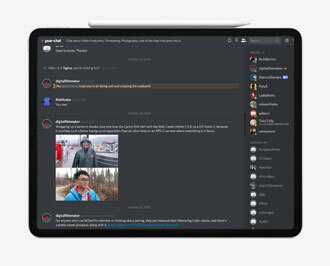 Everything about it feels well thought out and extremely well built. Top quality materials are used throughout, anodized aluminum, stainless steel, titanium, and rubber. I’ve used many follow focus units in my career and the Revolvr Follow Focus is not just good, it’s as good as it gets. And the orange anodizing looks cool sitting on the rods! Now for a few nits to pick. The Revolvr Follow Focus arrived with each part individually packed in an unusual bubble wrap sleeve. A box with the proper foam cutouts sized to fit into a Pelican case would be a nice touch. Everything about its use was easy to figure out except the hard stops. I had a difficult time getting them on and found it impossible to remove them. After a bit of struggle I emailed customer service and within 20 minutes received a call from Rob Eagle in the CA office. He stayed on the phone with me and walked me through the process which was rather simple and might have become obvious had I been a bit more patient. Still, directions would be nice. Fortunately Bright Tangerine’s customer service is exemplary and if you ever do have a problem you can be assured it will be resolved quickly and effectively. And the unit is covered by a two year warranty. Things have changed, a lot, over the years. 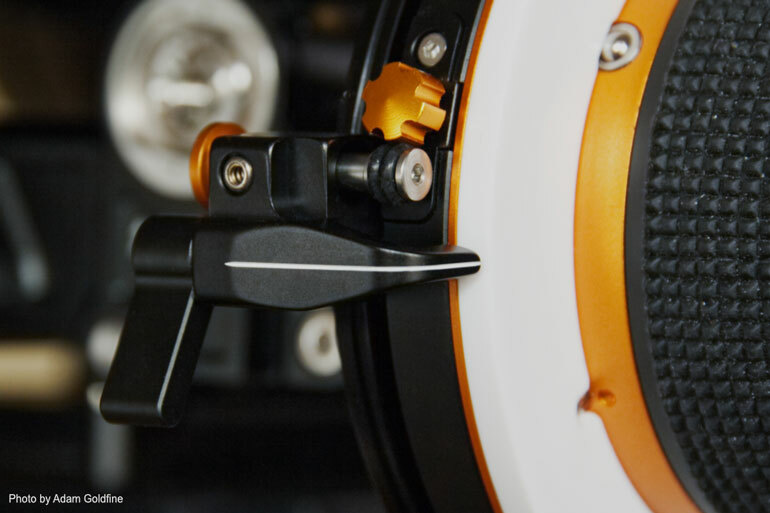 With the Revolvr Follow Focus, Bright Tangerine nicely bridges the world of modern electronic filmmaking where speed, flexibility, and adaptability are paramount, with the solid, well built, reliable quality of the more standardized offerings of the past. It can be expanded easily, fits any rod standard, and accepts multiple hand-wheels. Two different swing arms and drive gear sizes allow you to get just the right focus feel for any situation. And there are lots of thoughtful touches that you only discover with use. As technology evolves I’m sure I will upgrade cameras, computers, software, recorders, etc. But I have no doubt that this is the last follow focus I will ever buy. It is built for life and works like a dream. Adam Goldfine’s interest in filmmaking and photography started at an early age when he began experimenting with still cameras and super 8mm film. As his interest grew he decided to hone his skills at the Rochester Institute of Technology, considered one of the premiere photography schools in the world. His interest in filmmaking eventually led him to study motion picture production at New York University’s Tisch School of the Arts where he graduated with a Bachelor of Fine Arts. Immediately after graduation Adam began work professionally on the film Crocodile Dundee. He later moved on to the CBS Television series, The Equalizer. As his skills and talent grew he began working as a lighting director, camera operator and director of photography. In 1986, Adam completed work as producer and director of photography on his first feature film, Black Lights, White Shadows. The film gained international acclaim and attention and launched a career that includes 18 feature films, 15 feature length television projects and dozens of music videos, commercials, short films and documentaries. He later ventured into the world of visual effects working for Academy Award Winner William Mesa, long considered one of the most innovative visual effects directors in the industry. In addition to his film experience, Adam has a diverse business background with an emphasis on operations, marketing and communications. As Chief Operating Officer of top selling comic book publisher Chaos! Comics, Adam oversaw finance, operations, marketing and new business development. Under his direction, Chaos! grew from the ninth largest comic book publisher in North America to the fifth largest. He also oversaw an entertainment division, resulting in numerous development deals with notable Hollywood producers including Gale Anne Hurd, David Wolper Productions, Palomar Productions and Rhythm and Hues. Prior to coming to Chaos!, Mr. Goldfine founded and was president of GeoServe Communications, a full service web developer, based in Studio City, CA and serving the entertainment industry. Notable clients include CBS Studio Center, Panavision Hollywood, Polygram Filmed Entertainment, Wyle Electronics, HBO Films, Rysher Entertainment, MTV, CBS Television, NBC Television, PBS, Film Four – London, Warner Brothers Records, Atlantic Records, Sony/Columbia Records, Lucas Film, Paramount Pictures, EUE Screen Gems, Nintendo, Exxon, Estee Lauder and Drexel Burnham Lambert. He has worked with well known industry figures George Lucas, Tom Hanks, Paul Newman, Dennis Hopper, William H. Macy, Kevin Pollak, Anthony LaPaglia, Paul Simon, Jillian Murray, and many others.